Harry Steel was the first Ohio State wrestler to win the Olympic Gold Medal. Born in Stark County in 1899, he graduated from Canton McKinley High School in 1918. He lettered in football and wrestling at Ohio State. Leading his wrestling team to an undefeated season in 1921 and 1922, Steel served as Captain of the team and won the Western Conference Heavyweight Title in 1924. Serving as an alternate in the 1924 Olympics in Paris, Steel won the Men’s Heavyweight freestyle event. Steel has been inducted in the Helm’s Hall of Fame for Amateur Athletics in Los Angeles, and in the Varsity O Hall of Fame at The Ohio State University. He is now listed among the World Champions in the National Wrestling Hall of Fame. Ohio State’s Harry Steel was a big ol’ farm boy who had almost no coaching, but was strong as the proverbial ox. 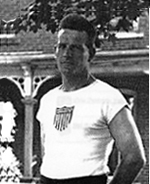 At the 1924 Olympics, he had no experience to speak of, his best finish against good competition having been third in the 1924 AAU tournament, but in Paris he came under the tutelage of America’s top wrestler, Robin Reed. Reed taught Steel some moves, notably a leg dive that he learned quickly and used throughout the competition. The new skills, combined with his natural strength, paid off, as he won the gold medal. I help you find actionable insight. This entry was posted in Character Studies, Military, US-Ohio and tagged dairy, farm, OH, Steele, war. Bookmark the permalink.